There are three known Rosenwald sheets, which were likely made in Florence around 1500, give or take a decade. 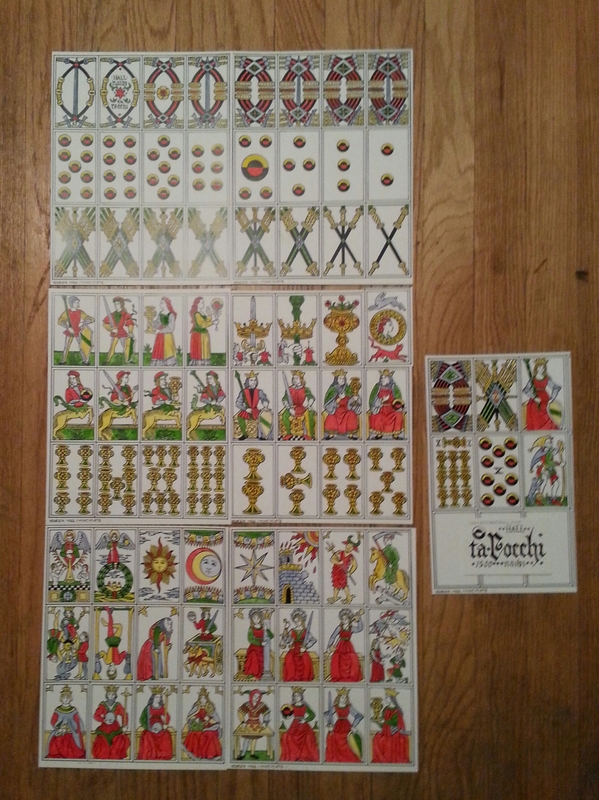 Although the sheets aren’t missing any cards, the three together do not complete any known pack, suggesting that a fourth block existed (there likely was a fourth side of two two-sided blocks). The contents of this block are up for debate, since, depending on its contents, it could complete a number of different packs. 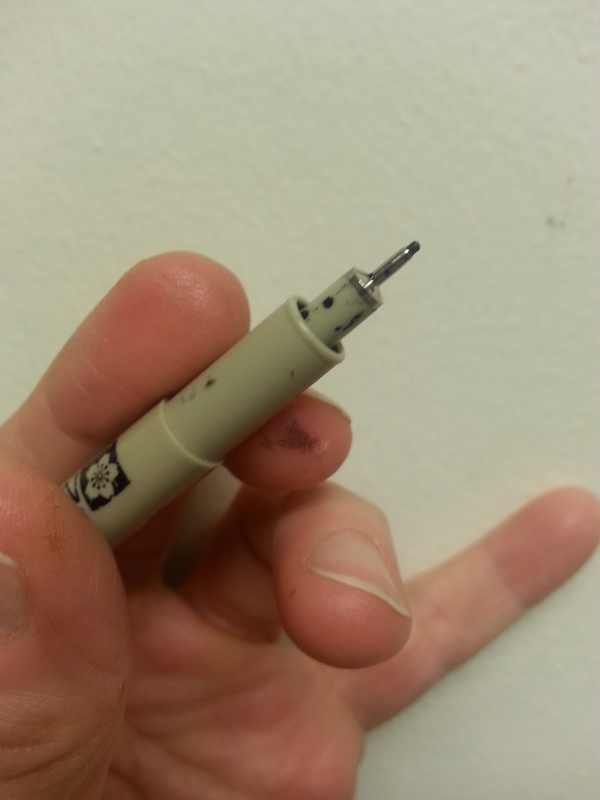 This would allow the manufacturer to produce a 52 card pack or smaller, all the way up to a 97 card minchiate. 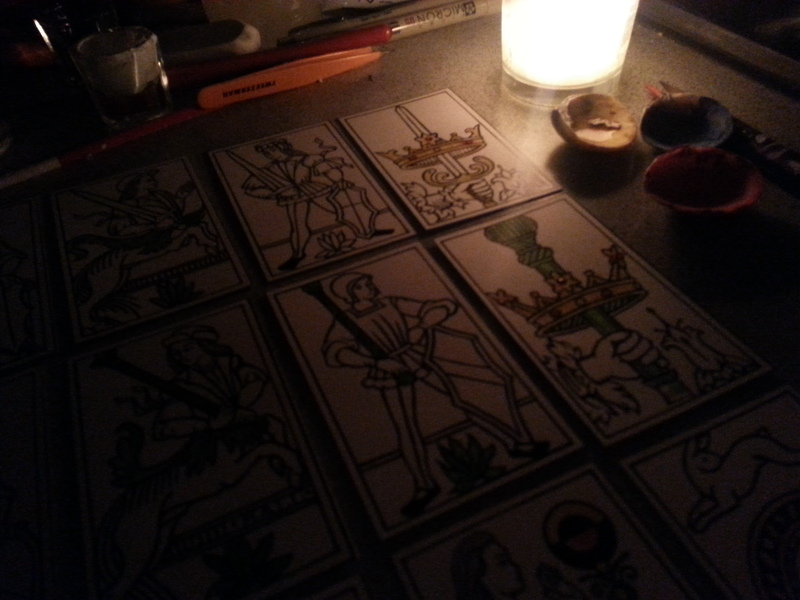 the first completed sheet of Italian tarot/playing cards. Numbering in the lower left keeps them in their original order. 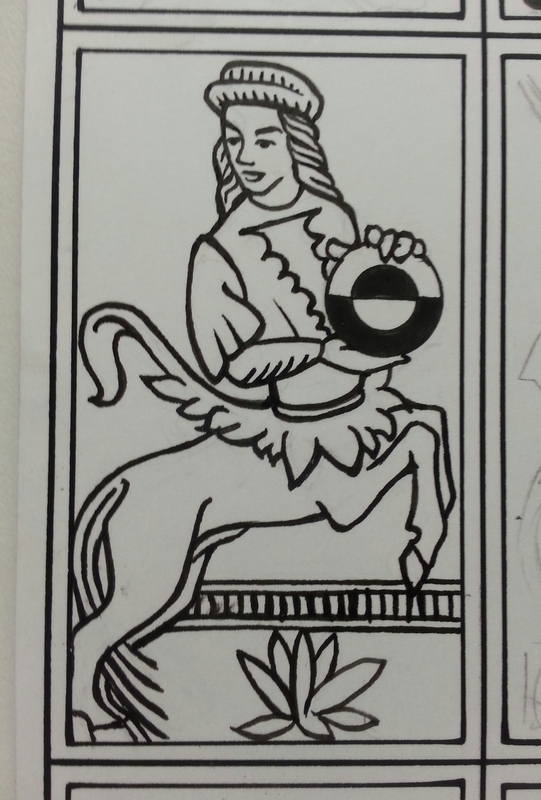 Only two cards are in need of serious restoration, those being the wheel of fortune and the (female) page of coins. 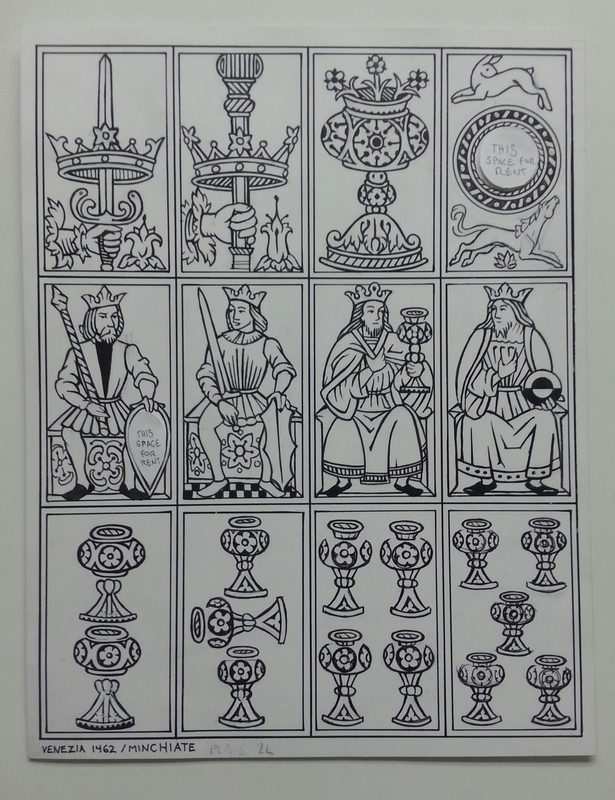 The absent cards include (hypothetically) the tens, the fool, the queen of batons, and the Minchiate additions of the virtues, elements, and zodiac. 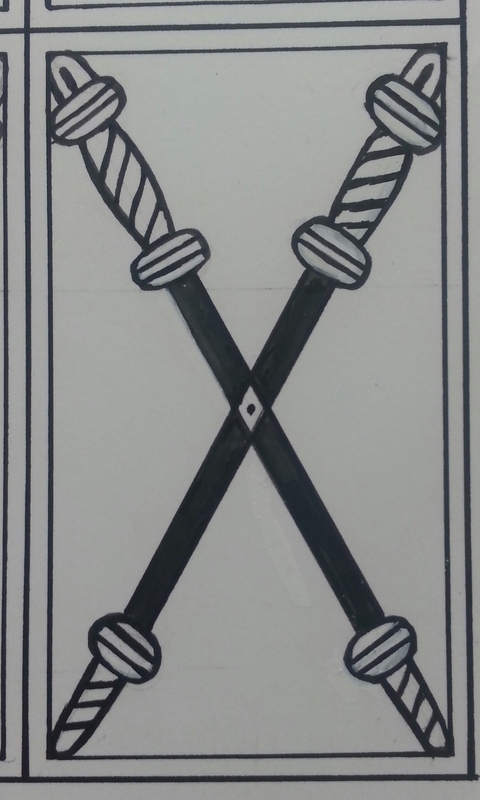 In producing previous packs, I have sometimes incorporated limited tracing for proportions. I found this step unhelpful here. Since the original manufacturer could start small and work his way up, I have the luxury of doing the same, and will begin with the small courts and numbered cards. I have used the same layout as is on the original sheets. 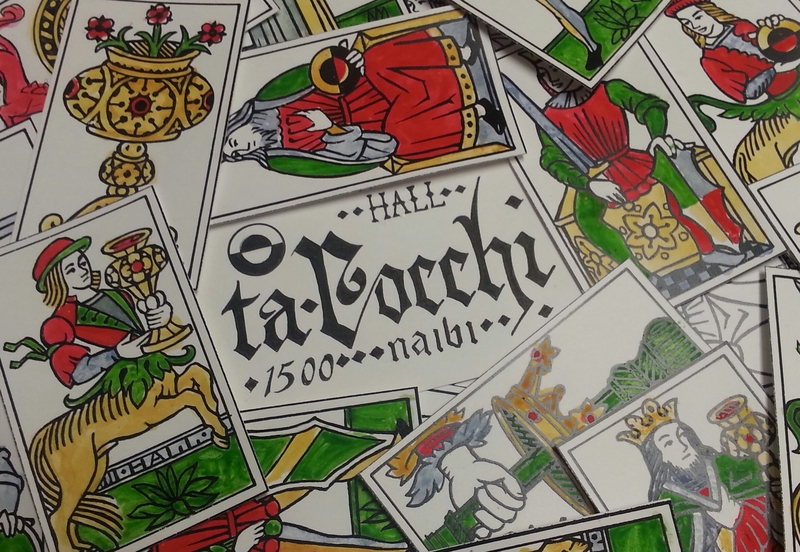 As a result, I will be able to offer the pack in sessions, starting with a complete Italian pack, followed by tarot and other builds. There are enough other builds, in fact, that I may have to do some polling to determine which pack will be most popular. -any cards related to the pattern. This includes early illuminated packs, as well as printed cards all the way until technology changes in the 19th century. Some local Italian pattens have changed little compared to others, and often maintained xylograph equipment well after other patterns converted to lithography. Much to my delight, some of these Italian relatives display a most remarkable combination of techniques; they are xylographed, then stenciled, then painted a la morisca, or finger-painted. This is the same technique as the “Morisca” pack from the late 14th century, employed, at least partially, up into the 19th. 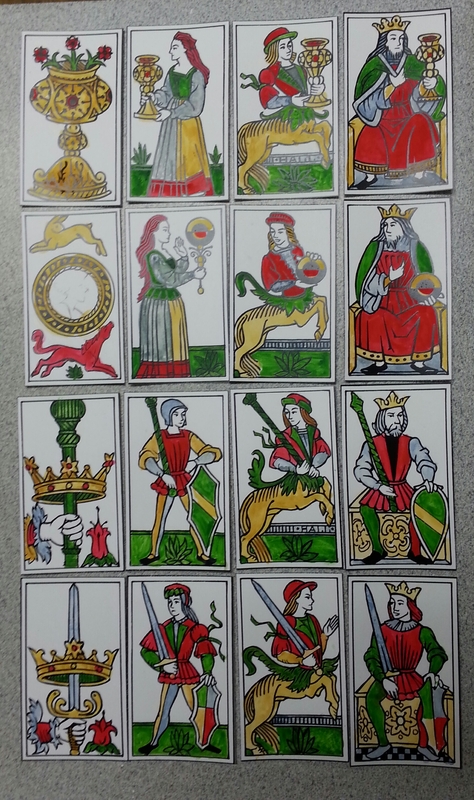 color test of court cards. 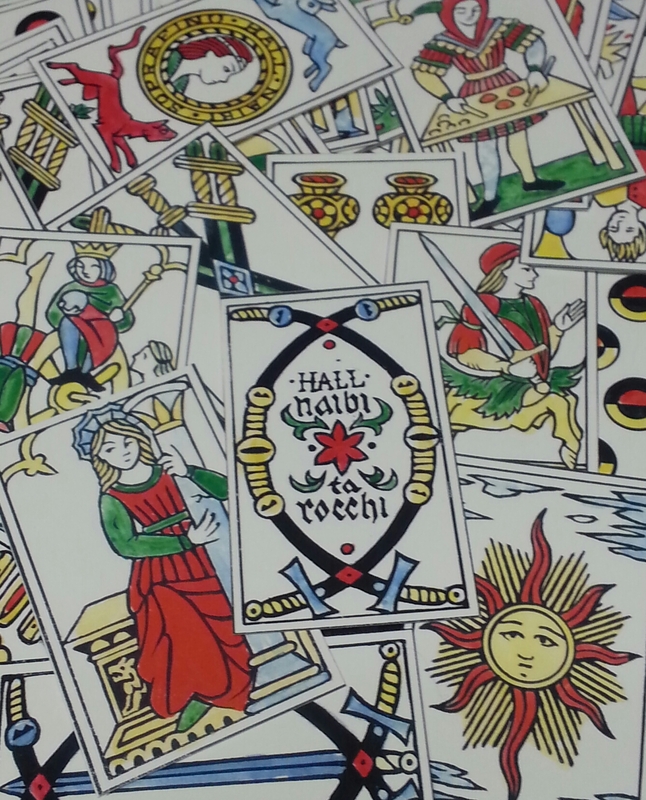 without a major arcana, they are Italian playing card courts. I’ve done a test run of colors, and came up with a four color palette that resembles those from southern Italy. I may adjust it a little, but I’m thinking these colors… look right. I will also offer these in very limited hand-painted copies. As there is much speculation of the contents of the missing fourth sheet, I decided to produce minchiate cards for the hypothesis. 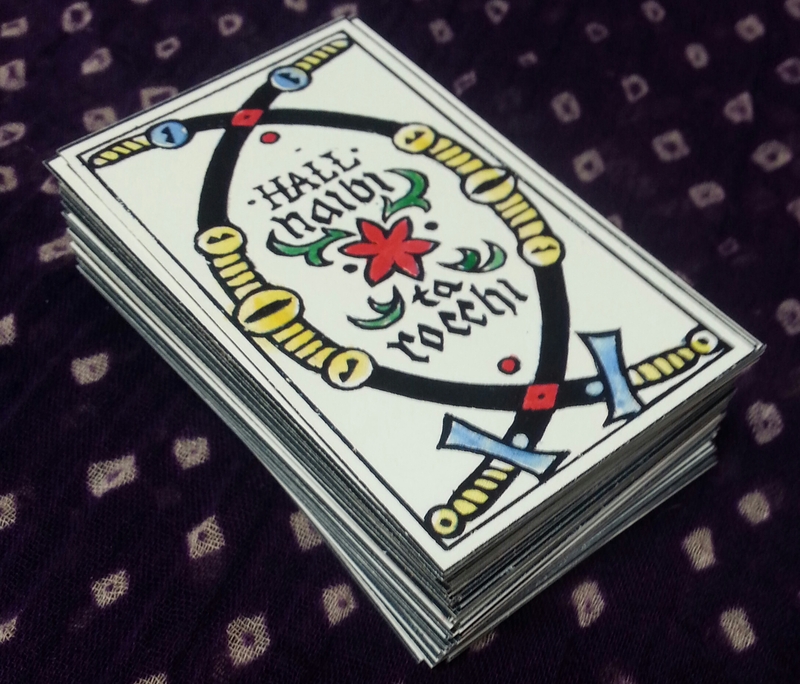 The numbers don’t quite fit, as there are 24 cards on each sheet, but a minchiate has 97 cards. was something printed on yet another block? Was something (perhaps the fool) omitted? In addition, a minchiate has never been found this old. Reference examples are XVII century, and originate from Florence and Bologna areas. 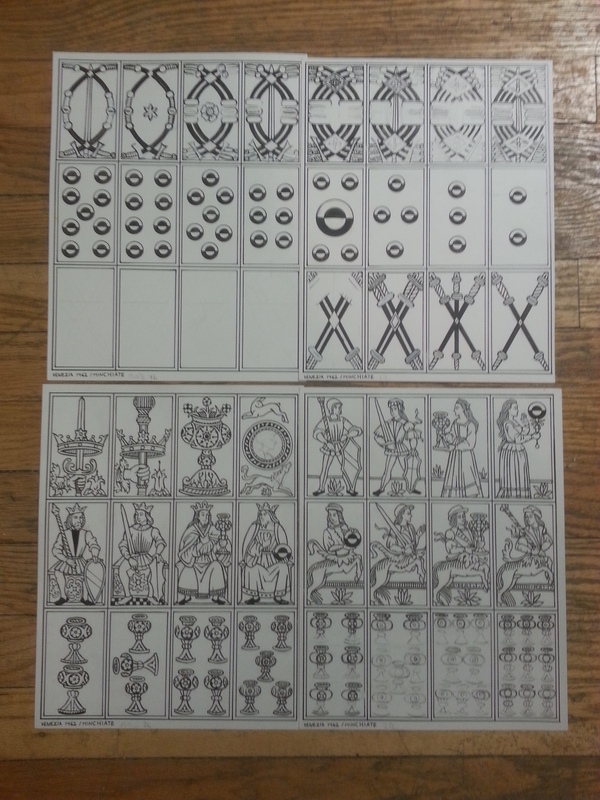 Modifications to these designs were to allow them to blend in to the Rosenwald cards. when printing my templates, I use a nearby shop whose machines I carefully tested for consistency and lack of warping. But alas, they have remodeled their shop, and the machines are re-arranged! I don’t have the resources to re-test at the moment, so the minchiate will have to be from the professional printers for consistency. Contact me at ladyheatherhall@humblechapeau.com, or via the form below. This source is very thorough.